How could we forget about you who supported us to go through our difficult journey and helped us make our dream came true!!! How are you? Hope you are well. We are doing fantastic!!! Everyday is blessing and full of happiness with the two little bundles of joy. Twins are already nearly 9 months old. Time flies, doesn’t it? It has been challenging to be a mum of twins but happiness from them is indescribable. We are absolutely happy parents. They are happy boys, too. Absolutely, I am happy to share my experiences with the potential parents from Australia. When we enjoy this unbelievable joy after having our boys, I feel obliged to share our experiences with others. I truly hope they can have this happiness one day and want to tell how much we were satisfied the services provided by you all. Please let me know how we can assist them. We are more than happy to help them. You will never be forgotten by us Maka. 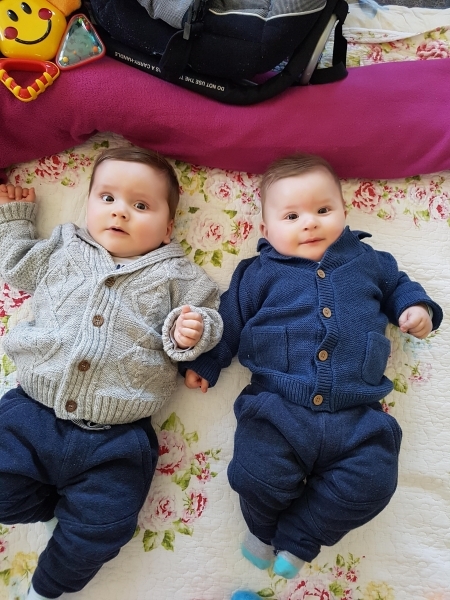 I am sending you a couple of photos of our twins. Thanks and contact me anytime you need. Network of New Life Fertility Clinics has helped over 7,000 Surrogacy babies come into the world and find their families. With a large database of both national and international egg donors and surrogate mothers, affordable and effective care, and compassionate communication, we are committed to providing every parent-to-be with a stress-free journey that successfully leads them to their ultimate goal: a healthy baby. © New Life Ukraine 2019. All right reserved.